Clear (Ceramic or Composite) fixed appliances (braces) used in combination with stainless steel fixed appliances on the back teeth are comprised of small ceramic or stainless steel squares (“brackets”) that are bonded with composite resin (dental adhesive) directly to the enamel surfaces of the teeth. A protective layer of dental “sealant” is applied to ensure safe placement and removal of the appliances, thereby preserving the enamel. 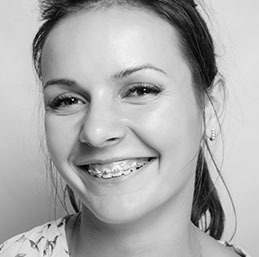 Bands (stainless steel rings with braces welded to the steel) are often used on the posterior teeth to ensure appliance retention. The braces alone do not move teeth; they are simply stable guidance mechanisms that allow wires and other accoutrements to affect the actual tooth movement (wires, chains, elastics, coil springs, and other devices). Careful brushing and flossing are advised daily. Brushing all around each and every brace is essential to the maintenance of dental health during the orthodontic process. Flossing – threading the floss under the wire at each point of contact – is advised at least once a day. Utilizing our new/ultra-precise method of “Indirect Bonding”, placement of the appliances often takes half the time of previous placement methods and is twice as accurate! A shorter, easier placement appointment makes for an easier start. Patients can expect to experience soreness of the teeth and irritation of the lips and cheeks for approximately 1-2 weeks. Thereafter, the appliances tend to become “invisible” to patients. Adjustment visits are scheduled at 4-8 week intervals as needed to affect the desired changes. A patient can expect 2-3 days of MINOR soreness in the teeth after an adjustment as the teeth respond to the changes implemented. The patient and orthodontist are partners in this adventure and helpful participation by the patient can make the process proceed as planned. Careful oral hygiene and compliance with all prescribed appliances can help to make the process a raging success!